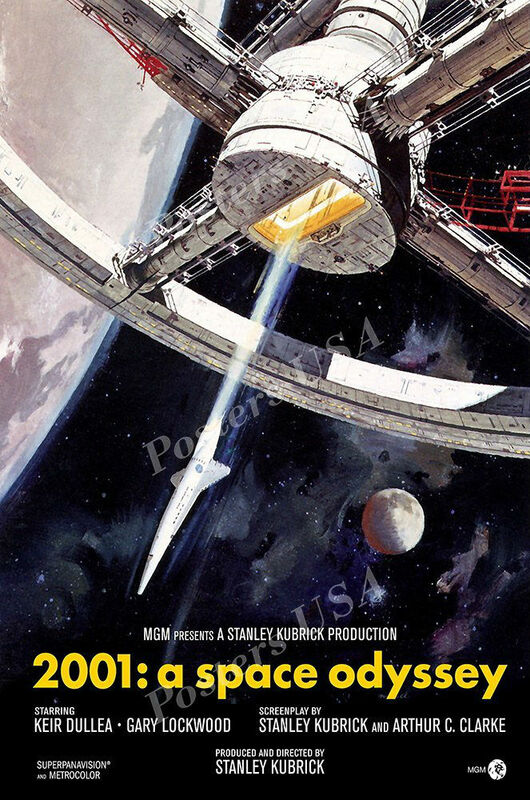 Fifty years later “2001” is still gathering accolades. Click photo to enlarge. In the fall of 1968 I was working part-time at a small college in England when the time came for an end-of-the year movie trip to London. The leader of our group plugged to see “2001: A Space Odyssey” which had just opened that April, 50 years ago this spring. I was never a science fiction enthusiast but was out-voted and off we went to London. Fifty years later “2001” is still gathering accolades for its special effects and a mysterious conclusion. The spine-tingling musical overture from Richard Strauss’s “Zarathrusa” set up a captivating anticipation. After an opening “apes-in-evolution” scene we view futuristic-looking space ships routinely carrying passengers to the moon, quite believable in 1968 as the Americans were ready to launch Apollo 8 in anticipation of a moon landing in July, 1969. Routine stuff by 2001, the film suggests. The eerie overtones involved four monoliths scattered across the solar system including ape-land and the moon with signals emanating from the Planet Jupiter. 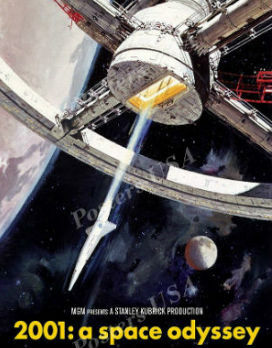 Thus the main plot unfolds as a space trip to Jupiter wherein astronauts are cryonically frozen to endure the long flight (see Box, below left). A SECOND LOOK (SL): Gordon Lore has been a prolific author and journalist since the 1960s whose beat has included the White House Press Corps in the Nixon years (he was in the Oval Office with President Nixon twice) and managing a celebrity-studded spa in Los Angeles. 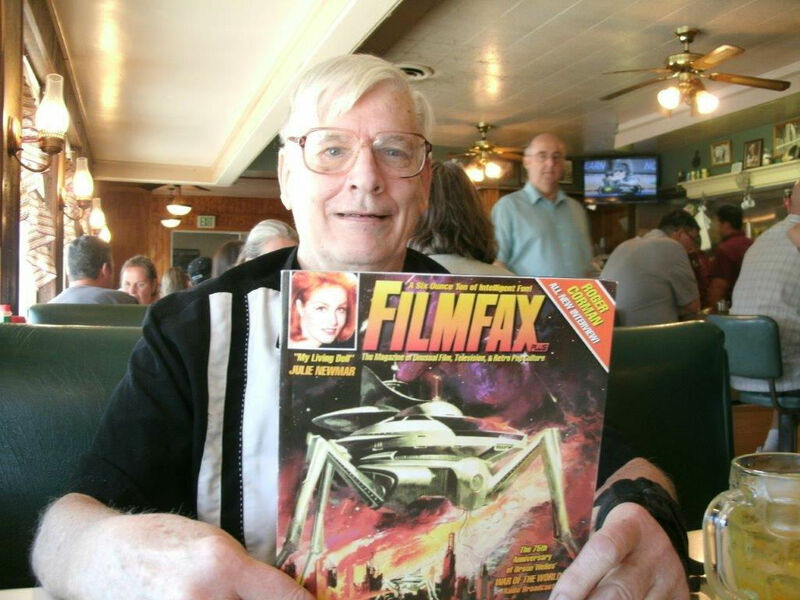 A former colleague of respected ufologist and retired Marine Corps Major Donald E. Keyhoe, Gordon was an un-credited scientific advisor on director Stanley Kubrick’s science fiction masterpiece 2001: A Space Odyssey. He talks to us about some aspects of his career, including the wider implications of Kubrick’s 1968 film. SL:Why were you contacted by the Kubrick team about the movie 2001? GL: It was back in 1967. I was in Washington, D.C., at the time working with NICAP, the world’s most respected and careful UFO organization that had been co-founded by Major Donald E. Keyhoe, a former close associate and friend of world-famous aviator Charles Lindberg. Keyhoe published his first book entitled Flying With Lindbergh in 1928. So, in the interests of strict scientific accuracy with an added touch of imagination, Kubrick wanted Dr. Frederick Ordway III to investigate ways in which astronauts might survive a lengthy journey into outer space. I mentioned the possibility of cryonic internment, something that was in vogue at the time. Baseball great Ted Williams, for example, had been so interred, in the hope that a cure for his demise might be discovered, a truly fanciful notion now, but it was in vogue back then. As the author of Mysteries of the Skies: UFOs in Perspective (Prentice-Hall, 1968) and Strange Effects From UFOs (NICAP, 1969) and as Donald Keyhoe’s colleague and Vice President at the NICAP, I guess Ordway felt I was scientific enough and yet perceived as imaginative enough to be a valid source. SL: Ordway was Kubrick’s technical advisor? 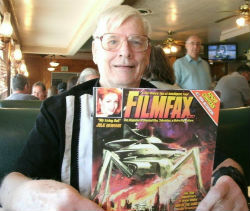 Veteran journalist Gordon Lore displays magazine he writes for showing his interest in sci-fi has not dimmed. Click photo to enlarge. GL: Exactly. As it turned out, I told him to contact one of our California Subcommittee members in the Los Angeles area, Dr. Leslie Kaeburn, who had apparently done some work on it. So I was considered an “un-credited technical advisor.” The whole 2001 project was big-scale and thorough with an enormous set in England. Ordway had worked with Wehrner Von Braun at the Space Flight Center and was moving with his entire family to England that year, 1967, and Kubrick wanted every detail in the film to be perfect. SL: What was your reaction when the movie debuted? GL: Like many people who saw it – great! Ordway had read Major Keyhoe’s books on the scientific aspects of space travel and UFOs and I could see this influence in the movie. By the way, the computer HAL is supposed to be a coded rewroking of the letters IBM, using the previous alphabet letter up – H, A and L.
SL: So you are an optimist about UFOs. Like Clarke, Kubrick, Speilberg you think they mean us no harm or keep monitoring our dangerous tendencies. SL: How did you end up with Keyhoe and NICAP? GL: I’d read Keyhoe’s books and was more than a little intrigued after three personal sightings of UFOs near my home on the Chesapeake Bay in Southern Maryland in 1955. I started my writing career for a subsidiary of U.S. News and World Report and had served two years in the U.S. Army (1958-1960). In 1965, I was singing folks songs at the Unicorn Coffee House in Washington, D.C., when I was approached by Richard Hall, the Assistant Director at NICAP, and was hired as a staff member that same night. The CIA actually put a stop to our operations in 1969. This was no great surprise to me since the NICAP Board of Governors was loaded with those who had CIA connections. Admiral Roscoe Hillenkoetter had been Keyhoe’s classmate at the U.S. Naval Academy. Truman appointed him as the first director of the CIA in 1947 and he was later appointed by Keyhoe as the Chairman of NICAP’s Board of Governors. Several other CIA operatives were also on the NICAP Board. After Keyhoe and I were fired at the end of 1969 during the CIA takeover, I then formed my own UFO Research Associates (UFOR) that lasted from 1970 to 1980. SL: I understand your book Mysteries of the Skies made a bit of an impact in its day? GL: Yes. It got a number of positive reviews. The angle of my co-author, Harold Deneault, and I was historical, to report on the UFO phenomenon before the modern era of sighting reports which began in 1947. The goal was to be as careful and scientific as possible, weeding out hysteria and fakery. SL: And you ventured widely into journalism and other pursuits after all this brush with the CIA? GL: Yes, interacting with famed TV broadcaster Dan Rather and my main White House mentor, Sarah McLendon, as a member of the White House Press Corps during 1971-1974. Sarah was my main sponsor for the National Press Club and Rather was my secondary sponsor. To this day, I am grateful to them both for their generosity. GL: Yes, indeed. My life-story came out in 2017 entitled Connections: A Lifetime Journey Through the World of Celebrity (BearManor Media) where I surveyed my career and the fascinating people I had met growing up just below the Washington, D.C. area – from Harry Truman to the Kennedys and legendary singer Burl Ives along with a number of other celebrities visiting my father’s marina on the Chesapeake Bay and as the General Manager of Beverly Hot Springs in Los Angeles. These celebrities included James Cagney, Robert Mitchum, Rita Hayworth, Tom Hanks, Jodie Foster, Tina Louise, Oliver Stone, the main cast of Star Trek: The Next Generation and many others, including one King (Gustaf Aldolf the Sixth of Sweden) and one former King (the Duke of Windsor, formally King Edward VIII of England). SL: Life has not been dull. GL: Not at all. I have a new book coming out this spring with BearManor Media with the working title of Flying Saucers From Beyond Earth: A UFO Researcher’s Odyssey where I return to my starter subject. SL: Good luck and thanks for sharing this time with us. GL: You’re most welcome. Thank you! The encounter with the strange paranoid on-board computer HAL begins to steal the show for a while until we are directed back to the theme of evolutionary transformation of a Space Child facing earth, a giant baby floating in space. This hearkens back to the evolutionary development that is implied in the opening with the ape sequence. I won’t spoil it for you but one obvious theme in “2001” is the idea of humanity needing to be sped along on the evolutionary ladder to become Superman as the philosopher Nietzsche had argued in his “Thus Spake Zarathustra” explaining the musical overture by Richard Strauss. With the name Neil Armstrong about to become a household word, “2001” played to the spirit of the times and especially the optimistic overkill of the technological flower-powered 1960s when the movie was first conceived by acclaimed director Stanley Kubrick. It’s high production values and futuristic glimpses of sleek space hardware, helped make “2001” a text for the times. Even then, I walked away with two “takeaways” – the optimism about the human future inherent in routine moon trips and the creepy rebellion of the computer HAL perhaps bespeaking earthly worries and fears about the possibility of human-made machines perhaps taking over. The 20th Century Christian writer C.S. Lewis was alive when the Soviets blasted a man into space in 1961 and he was surprised at how some quick conclusions were reached that finding life on other planets would invalidate the Bible and the entire concept of God. The versatile C.S. Lewis was one of the first Christian writers to delve into science fiction. Lewis begged to differ. In an essay titled “God and Rocketry” around 1961 he hinted at the only real question in encountering life in outer space. This is the matter of whether these creatures were exposed to sin like we have been – in Christian terms: are they fallen or unfallen creatures? 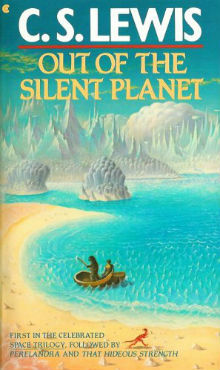 In 1938 Lewis had already explored this intriguing idea in Out of the Silent Planet, one of three novels usually called his Space Trilogy. In them he encounters innocent creatures who are appalled at such things as killing and murder. The human space traveler, Ransom, finds himself trying to preserve that primal innocence while warning them in the next novel Perelandra – usually considered Lewis’ masterpiece – against evil and evil beings. Thus Lewis, like St. Paul, was ahead of us in outlining some evangelistic possibilities behind our own close encounters of the surd kind. How to reach people in the era of outer Space – a worthy goal indeed. New Testament professor Bernard Scott in Hollywood Dreams and Biblical Stories writes that “the power of story surrounds us. Television is a continuous set of stories – maybe the same story over and over.” Stories, he offers, “allow the teller and hero to experiment with options for existence. They allow us to undergo a life experience without risk…Understand how a society tells its stories and you understand that society.” Christian writer C.S. Lewis, a literary expert, says that imaginative stories “do something to us at a deep level.” Scott knows that Christians are called, in St. Paul’s phrase,”to be all things to all men.” To bear responsible witness to a culture it is vial to learn the language of that culture, a primary step in being good missionaries whether to the Sahel or to the young people transfixed by the latest Hollywood block-buster. “2001” certainly affected famed director Stephen Spielberg, who offered his own optimistic picture of helpful aliens in “Close Encounters of the Third Kind” (1977). His colleague George Lucas fired it back as the most successful movie series of all time – “Star Wars.” When stories keep getting repeated in variations of the same style they take on a mythic quality. Thus the Greeks had the myth of the Greek heroes at the siege of Troy and the Romans favored their own military demigods just as the British in the Middle Ages capitalized on the King Arthur legends. It is only natural, then that our latest mythologies would have a technological focus. The movies, like all attempts at myth-making, offer a kind of shorthand way to communicate to a culture. Billy Graham would often do this in his crusades. He would reference the movie "Lord of the Flies" or the musical “Jesus Christ Superstar” and Billy Graham as a communicator was hard to ignore. He stayed up to date. Thus “2001” and its attempt at a scientific definition of God behind it, a theme the “God is Dead” 1960s audiences could accept. A technological vision. And what that seems to tell us is that beyond the fascination with gadgetry so prevalent today and the ever-smarter special effects, people at some subconscious level are still trying to piece together a larger sense of meaning, of some purpose to their existence behind the mundane world of 9 to 5. And that quest has haunted humanity in every generation as a disguised search for God. Kubrick at least knew what he was about. Especially did the quest need to be translated and disguised in an era – the 1960s – which had dared to ask if the traditional God of the churches was dead. That was in 1966. As it tuned out the subject of God came roaring back into the news in the 1970s and 1980s with the advent of televangelists and ayatollahs. God was not dead, we had simply been too dazzled to notice for a while. The educated apostle Paul knew how to reach diverse audience groups. 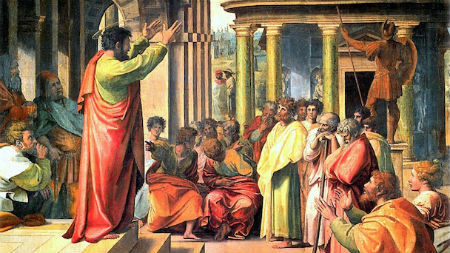 Using the culture to reference God was St. Paul’s approach in First Century Athens. Brought before the wise men of Greece for expressing the outlandish idea of the resurrection from the dead, Paul began his defense with references to Greek culture – in particular to an “Unknown God,” a statue they had erected. “The Unknown God” became Paul’s text to these learned philosophers and it led into a witness beginning with “God who made the world” (the question of origins) and leading to quotes from two Greek poets on the question of the human prospect (“we are his offspring”) and ending solidly on the matter of Jesus and his resurrection. He presents Jesus not as the Jewish Messiah but as “a man whom he appointed” which is cultural savvy, fitting in with the Greek penchant for human-centered thinking. So today, Christian missionaries and expositors must learn to speak to the culture from within the culture and then try to lead people out of it to an even more meaningful reality. Until very very recently, science and technology were two of the leading “Gods” of our age. The Sixties were hailed as “technology’s golden era” – the computer, micro circuitry, the moon landings and aerospace. Yet here was the creator behind “2001” testifying that we need some concept of God to give meaning and value to our lives. The philosopher Pascal had talked about the “God-shaped blank” inside all of us and the fertile minds behind “2001” were cousins of a kind. The fictitious Super-Intelligences working through the monoliths in “2001” beckoned humankind on to a rendezvous in space which held inside it the implications of a new birth and the dynamic new beginnings of a better human race. New birth? Higher Intelligences? Ultimate purpose behind the outward show? Hmm. Here are themes Bible believers can readily go to town on in 2018…and beyond.